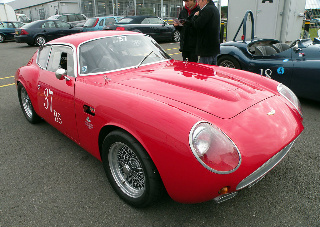 Four of the chassis used on the original Zagato sports car (also referred to as Sanction 1) were duly modified to produce lightweight versions that would be ideal for racing. These racers incorporated the following features to improve aerodynamics: A lower roofline - Enlarged rear wings, with a restyled tail section, and an extended front section. One of these restyled Zagatos made it debut at the Goodwood race track in early 1961 when, driven by Stirling Moss, it finished in third position, with its arch rival, the Ferrari 250 GT, taking the chequered flag. However, a couple of months later, two of the quartet, supported by Aston Martin and assigned to Essex Racing, were entered in the Le Mans 24 Hour race, but both were forced to retire. Not to be outdone, in July 1961, one of these cars claimed the Zagatos first win in one of the races as part of the British Grand Prix. A further attempt at Le Mans in 1962 ended in early retirement through engine failure. 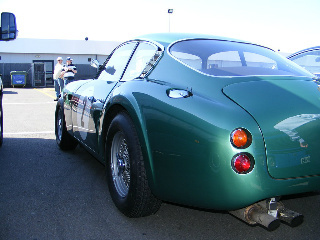 Production of the DB4 Zagato ended in 1963 with 19 of the sports cars being built. However, this was not the end of the story. In 1988, having approached Aston Martin, it was decided to modify four of the original DB4 chassis so that they could be transformed into a lighter weight construction, identical to that used in the DB4 GT. These were then shipped to Milan to receive bodies comparable to those used in the original Zagatos of the early 1960's, with the distinctive small oval grille, and a smoother, restyled rear section. The first of these modified rolling chassis was shipped in January 1989, with the fourth three months later. These four officially approved replicas were designated as Sanction 2 cars. Although there was little difference, externally, from the originals, modifications were made to improve the handling characteristics, whilst the engine capacity was increased from 3.7 to 4.2 litres, and the size of the road wheels was reduced from 16 to 15 inches. All four replicas were completed in July 1991, but were not permitted to display the original Zagato badges. When placed at auction, these replicas were sold for as much as $1.25million. Following the sale of the four Sanction 2 Zagatos, it was found that there were still two additional Zagato body shells that had not been used, for whatever reason. Therefore, in 1992, Aston Martin was approached with a view to creating further Sanction variants. Following agreement, another two DB4 chassis were discovered, and were duly modified to produce, in conjunction with the newly found Zagato body shells, a final two DB4 Zagato replicas, which were completed in 2000, sporting the original Zagato badges. These were designated as Sanction 3 sports cars. By 2000, a total of 19 original and 6 Sanction DB4 Zagatos had been built, and were highly prized, with six figure valuations. Accordingly, since then, other non-original, and non Sanction replicas have been built, based on the chassis from DB4's and DB4 GT's. However, such replicas did not have the Zagato sports car cache but were, nonetheless, still desirable, and with a ready market.